Checked all ICs used in other projects for compatibility and cannot match what it was. Sort of remembering the LEDS flash when correct tones or pair of tones are present, as in a RTTY tuning indicator. Clues, please ? Any dual PLL in 14 pin ? Sure sounds like a dual PLL, but could it be a dual opamp? Only remember it worked well. What a brain twister doing reverse design when memory is not collaborating. The original post has been edited now; added a picture of the contraption. First, can you explain exactly what it is that this does. I understand it must be some frequency determining indicator for rtty tuning. 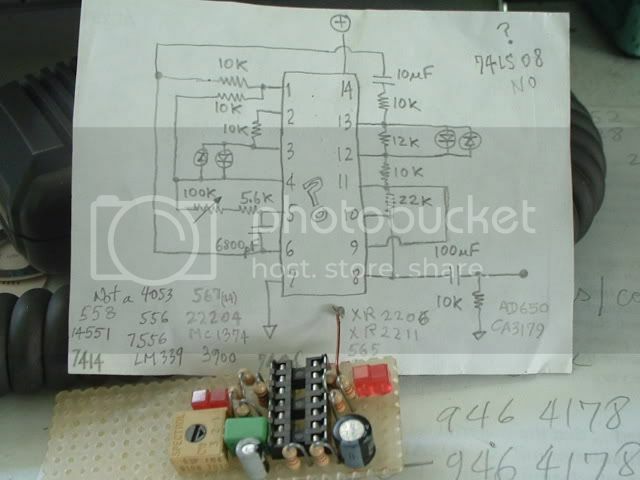 Was this a published circuit or something you designed, and how long ago? Did you buy from locals, like radio Shack or did you have access to industry wide components? Tell us all you know! Externet wrote: It has a potentiometer on a RC circuit as to tune to the audio fed to pins 5 & 6. So the audio goes to pin 8 through the resistor string and the 10uf to pin 6? Does it tune an oscillator is is it something like a filter? Look into the 4xxx series. Some use pin14 power, 7 ground and pins 2, 3, are outputs. It has a potentiometer on an RC circuit on pins 5 & 6 as to tune to the audio fed. - I designed the application ~10 years ago probably reading its data sheet. - Yes, audio is fed to pins 8 & 10; probably for two internal separate circuits to detect the high and the low tones and flash one pair of leds on one and another pair of leds the other tone. - Most of those resistors should be feedback gains and coarse frequency ranges. The way they are drawn appears to be in an audio string but not. What a hard thing ! And, so is this thread kaput! Did everyone quit? pin 1 to cancel out those frequencies to create a beat frequency? to a simulation? Mine is out of commission until I can get the Win7Pro upgrade. That is great! suggestion, CeaSar. I do remember both of each led pair appear to light up as the frequency is high enough taking turns every cycle. When properly tuned, both pairs appear lit. As probably in AFSK / RTTY tuning. - or their centre frequency. * I tried to find which 14 pin chip would have + at 14 and gnd at 7; many do, no problem there. but unable to find which have 3&4 and 12&13 as individual opamp or comparator outputs. Yes, could be a quad something. Thanks for playing this mindtwister quiz. Hi Miguel. This is a bit late, but it's the first time I've seen this thread. My bet is that the IC is a 4000B series CMOS logic hex inverter with sections of it used as linear inverting amplifiers. First clue is the power/ground terminal arrangement. Either a 4069B, or the heavier duty 4049B? Edit May 2: After further analysis, it does look like a B series CMOS hex inverter with all 6 sections used as inverting op amps. The circuit has no input, only an output. It has an adjustable frequency oscillator. Two sections are in parallel and used to buffer (lower the impedance of) the output. Possibly it was used as an audio oscillator or a BFO? Will investigate what series 4000 could I have used there, and digest your suggestions. It is obsessive now. It does have input, highly probably audio into pins 8 & 10. Output was -this for sure-, the counter paralleled leds pairs as indication only. BFO does not ring enough bells, but a possibility. Detecting AFSK -audio frequency shift pair- has more chance to be; to fine tune a radio receiver properly. Two leds for one frequency, two others for the other frequency. When all four leds lit, audio frequency pairs is valid to decode into a text readout. Or, DTMF IC without crystal? The part is there has to be AC at the output pins for both leds to light up.